Saturday April 17th 1926 Edith and I met Paul at 11.30. But he could not go to Van Nuys. We had lunch together and went to a show. She went on home and I to the hospital. I did some errands for Warner. To Pasadena after that. letter from Lydia. Sunday April 18th 1926 Paul took us a wonderful ride before he left me at The Roslyn where I was to meet Lizzie Felkner. We had dinner and spent the time till four oclock. I went to the hospital and on out to Seiberts. They had gone to Emilys. Miss Eavens was here. Monday April 19th 1926 I wrote letters in AM to Hattie, Lydia, L D L and Nellie McCall. Came down to see Warner. Stopped to get mail at Otts. A letter from Hattie. Reached Matties room at 5.30. Went to bed early. 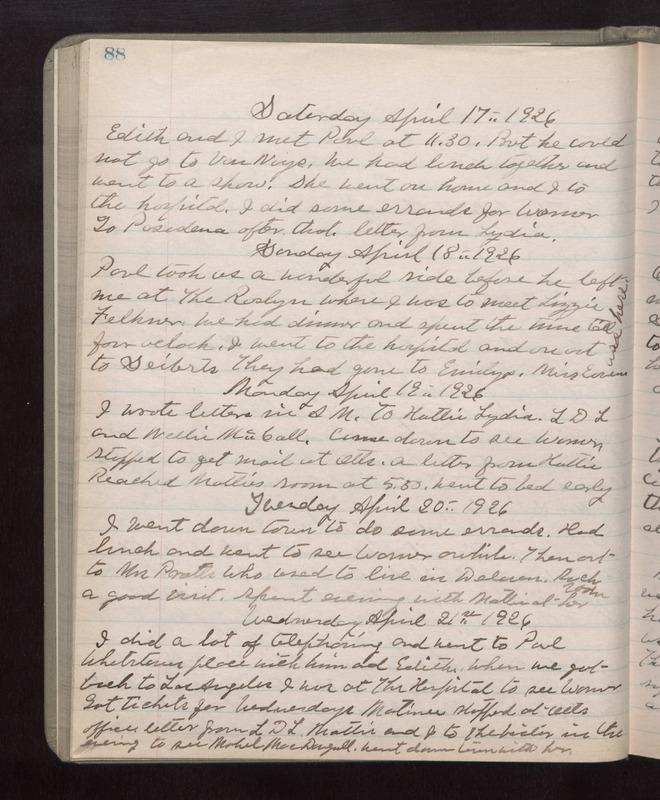 Tuesday April 20th 1926 I went down town to do some errands. Had lunch and went to see Warner awhile. Then out to Mrs Pratts who used to live in Delavan. Such a good visit. Spent evening with Mattie at her room. Wednesday April 21st 1926 I did a lot of telephoning and went to Paul Whetstones place with him and Edith. When we got back to Los Angeles I was at The Hospital to see Warner. Got tickets for Wednesdays Matinee. Stopped at Otts office, letter from L D L. Mattie and I to The Victor in the evening to see Mabel MacDougall. Went down town with her.